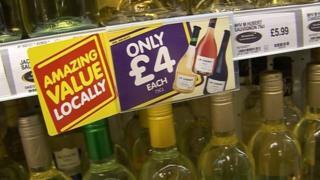 Scotland should introduce alcohol-only check-outs and ban drinks advertising, health professionals have said. The measures are among 20 recommendations on alcohol marketing made by Scottish Health Action on Alcohol Problems (Shaap). It wants alcohol advertising to be devolved and an independent regulatory body set up to control it. The Scottish government said the next phase of its Alcohol Framework Strategy would be introduced later this year. Shaap, which was set up by the Scottish Medical Royal Colleges, has written to MSPs setting out its manifesto in the run-up to May's Holyrood election. It said Scotland had one of the highest liver cirrhosis mortality rates in western Europe, with alcohol death rates almost twice the level they were in the early 1980s. The manifesto called for a national licensing authority to regulate the number, type and opening hours of alcohol outlets as well as a legal requirement for alcohol-only check-outs in all licensed shops. It also called for a target date to be made for the prohibition of all alcohol advertising, except in licensed premises, with an immediate ban in sports-related settings, including sponsorship. All alcoholic products should also be labelled with ingredients, calorie counts and health risks, it added. Shaap said Scottish government plans for minimum unit pricing, currently subject to legal challenge, should be implemented "as soon as possible" while Scottish ministers should also campaign for the reintroduction of the UK alcohol duty escalator and support a UK review of alcohol duty rates. Director Eric Carlin said: "After several years of welcome reductions in alcohol-related hospitalisations and harms, these are both on the increase again. "It is vital that alcohol policy in Scotland should be aligned to the WHO's (World Health Organisation) 10 'Best Buy' recommendations, with a specific focus on increasing the price of the cheapest, most harmful products and taking action to restrict the availability and marketing of alcohol." Public Health Minister Maureen Watt said there were about 22 people a week dying in Scotland because of alcohol and there was "absolutely no room for complacency." "We will introduce the next phase of our Alcohol Framework later this year which will build on the progress so far," she said. "Given the link between consumption and harm, and evidence that affordability is one of the drivers of increased consumption, addressing price is an important element of any long-term strategy to tackle alcohol misuse and as such we remain committed to introducing minimum unit pricing."